I am running for Denver Clerk and Recorder. Our current Denver Clerk is choosing not to run at the end of her term, so it is an open position. My election day is May 7, 2019, which is the Denver municipal election (when Mayor and City Council are also elected). It is a nonpartisan election, so candidates do not run with any political party affiliations, and there are no primaries. If many candidates run for Clerk and no one receives 50% +1 of the vote, a runoff election with the top two candidates will be held in June 2019. As a young girl growing up in Arizona during the early 1980s, one of my heroines was Sandra Day O’Connor. In the years that followed, I was inspired by many women leaders in government and the law to follow a career in public service after law school. Because I have spent most of my career focused on making our democracy more accountable to the people, I’ve been asked by many community members to run for office at different times. But it never felt right. 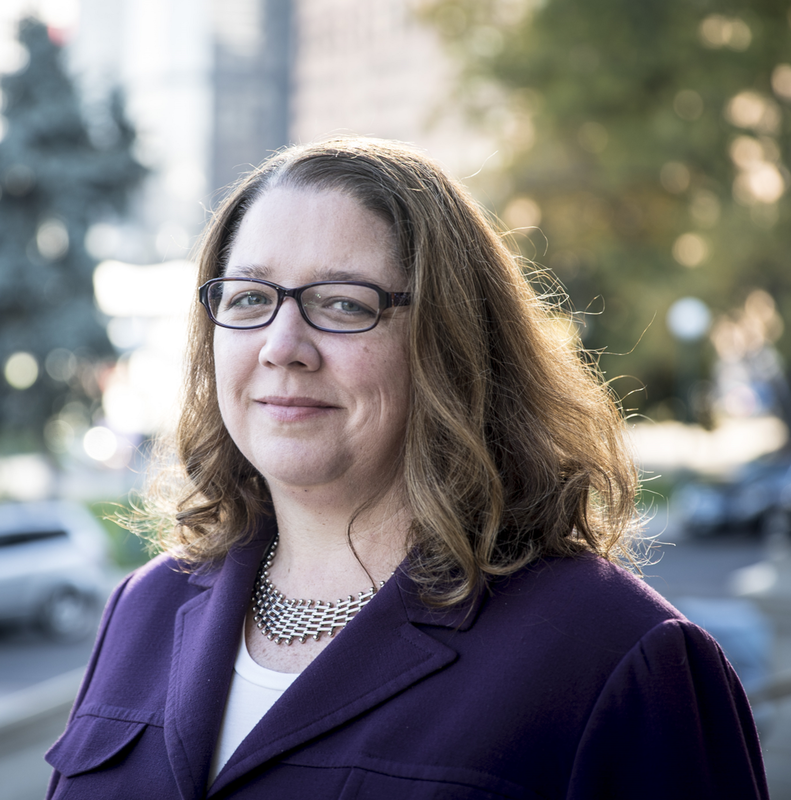 When the Clerk’s office became open I decided to run because it was the perfect fit for me to continue to work for citizen access and government transparency in a way that can make a difference for the people of Denver. My undergraduate degrees are from Arizona State University, and then I attended Georgetown University for law school. After graduation, I spent many years as an attorney in the federal government before returning out West. First, I served as policy counsel at the Federal Election Commission protecting voters’ access to campaign finance information and trying to keep candidates and elected officials more accountable to voters than big money interests. Then, I was nonpartisan Counsel to the US House of Representatives Ethics Committee during Speaker Pelosi’s leadership. My husband and I moved to Denver in 2010 to raise our kids closer to family scattered across the Western states. Since then, I’ve been excited to put my expertise in election law, government ethics, money in politics, and public records to use at the state and local level. For 5 years I worked as Senior Counsel to Colorado Ethics Watch, and now I’m on my own providing policy research and advocacy and democracy education materials and workshops to nonprofit and civic organizations. I’m also an adjunct professor at University of Denver for programs in the Colorado Women’s College and University College. In addition to the responsibility of running all statewide and city elections in Denver, the Clerk’s office provides many resident services such as marriage licenses, land recording, foreclosure process oversight, and access to many city records. It is the place where Denverites interact with government at the local level, and I believe that a citizen-centered approach of accountability, transparency, and accessibility will enhance voters’ confidence in government. Specifically, my priorities are protecting the right to cast an informed ballot, providing equal access to the Clerk’s services, and modernizing transparency of City records. With that combination, Denver residents will have the tools and support they need to participate more fully in city governing not only on election day, but all the other days in-between. Like many women, a day in the life of my campaign is an elaborate juggling act of getting kids to school, participating in legislative policy meetings, grading assignments for my classes at DU, meeting community leaders (or talking on the phone) about my campaign and vision for the Clerk’s office, returning LOTS of emails, picking up kids from school, attending/playing taxi driver for kid activities, dinner (sometimes), evening campaign receptions or community events, more computer work and sleep eventually. It’s a lot – that’s why it was so important for me to have a group decision with my husband and kids (both teens at home) before I ran for office. My daughter is very excited to help register young voters and explain what the Clerk does to her high school friends, and my son has offered his artistic and designer eye when it comes to photos and other creative ideas for the campaign. My husband is amazingly supportive, both emotionally and logistically, and I couldn’t do any of this without my family team! As a first-time candidate, I have taken on the challenge of a city-wide campaign but for a down-ballot office which does not have nearly as much media attention or voter interest as Mayor or City Council (or state legislative and executive offices). There is a large drop off in voters who don’t even vote for the office of Denver Clerk when they turn in their ballot! So, a lot of my campaign time is talking about what the office does and why it is important to the city. This lack of information and prominence is also a barrier to fundraising, which is already more difficult as a woman candidate. I feel that I am often held to higher – and sometimes conflicting – standards of experience and “electability” before donors and some endorsements will consider supporting me as a woman candidate. The two most important things women can do to help are to (1) donate to support my campaign, and (2) tell your fellow voters in Denver about the Clerk’s office and why it is important to elect the right person for this local government seat. Every dollar I raise helps me talk to more voters about the Denver Clerk’s office and learn about their needs for improving the office. I’m a big bookworm and Sci-Fi/Fantasy nerd – Star Wars, Star Trek, Harry Potter, and lots of obscure stuff you have never heard of. My family and I have become regular attendees at Denver ComicCon; maybe I will see you there in June? Thanks for reading and being interested in learning about different women candidates and state and local offices around Colorado!